Enhydro is Greek for "water within". 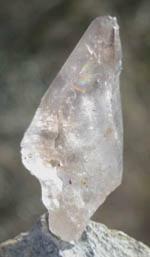 These are crystals that contain pockets of ancient, pure water. 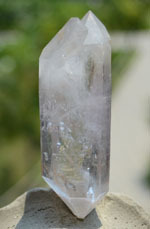 As water has traditionally indicated the emotions in terms of the 4 elements (earth-body, water-emotions, air-mind, fire-spirit), these crystals can have a profound effect on our emotional well-being. Large, easily seen moving bubble in a perfect Brandberg Twin DT. 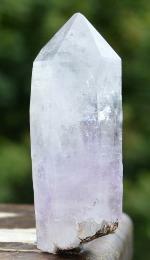 "Brandberg Amethyst attunes to pure consciousness and is the most versatile and multi-dimensional healing tool on the planet, unparalleled in its beauty, energy and light.” Judy Hall. Rare DT Generator with at least 2 moving bubbles. At least 1 easily seen moving bubble and complete Self-Healing. At least 1 easily seen moving bubble and complete and very beautiful etched Self-Healing. This is a rare Omasheko Brandberg, from a remote location in the Brandberg range. 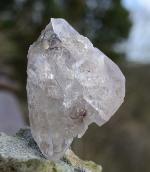 These unique crystals formed in calcite which later dissolved, creating wonderful etching. 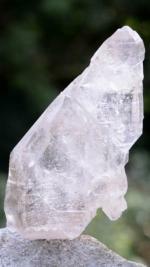 The energy amplifying properties of calcite make Omashekos the most physically energetic Brandbergs. What at first looks like a smokey is the result of a rare black phantom. Deep calcite growth interference etching, moving bubble, rainbows, tiny red harlequin flecks (best appreciated with a loupe), and a fully intact elestial DT. Unique. This is a rare Omasheko Brandberg DT Tabby from a remote location in the Brandberg Mts. 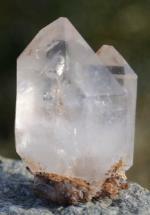 These unique crystals grew encased in calcite which later dissolved, creating the wonderful etching. 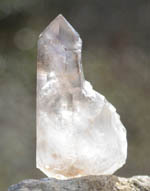 The energy amplifying properties of calcite make Omashekos the most physically energetic Brandbergs. Super rare. Exaggeration? 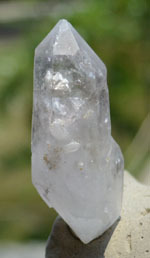 Try and find a single Master Self-Healed Negative Manifestation Enhydro Sceptre on any of Googles 257 million "crystal healing" pages. Omapeleki Brandbergs are mined in the remotest regions of the Gobogobos mountains and are brightest of all Brandbergs and uniquely energetic.